Watch Out for These Creepy Christmas Characters! The winter holidays are a season of joy and love; everyone is familiar with the jovial and generous image of Santa Claus, who cheerily fills the stockings that we've hung by our chimney with care. But Santa isn’t the only mythical being associated with the Yuletide season – in fact, there are plenty of legends and lore about characters that are slightly weird and often downright terrifying. From the claws of the Krampus to the child-eating Icelandic Christmas Cat, here are some of the creepiest holiday creatures from around the world. 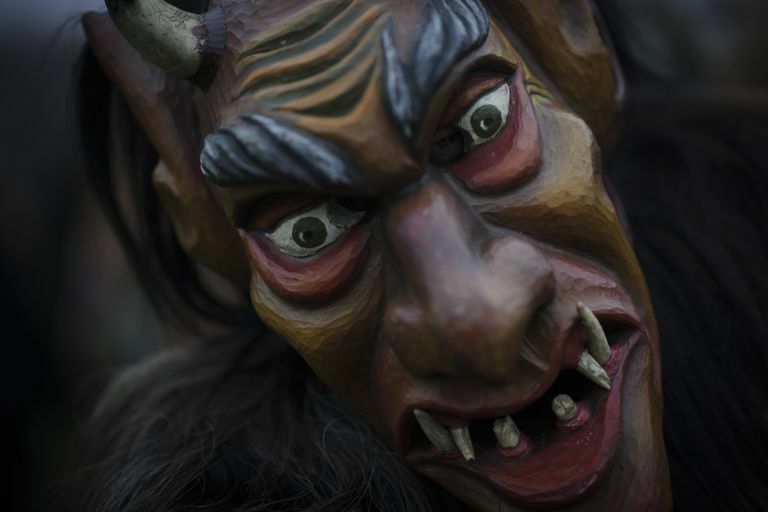 The word Krampus means "claw," and certain Alpine villages have big parties featuring a scary clawed incubus who hangs around with Santa Claus. The Krampus costume also includes sheepskin, horns, and a switch that the incubus uses to swat children and unsuspecting young ladies. The Krampus' job is to punish those who have been bad, while Santa rewards the people on his "nice" list. Although the exact roots of Krampus aren't known, anthropologists generally agree that the legend probably derives from some sort of early horned god, who was then assimilated into the Christian devil figure. During the fifteenth and sixteenth centuries, masked devils began appearing in church plays during traditional winter celebrations. These events, which often had some fairly comedic and ludicrous elements to them, became part of the pre-Christmas fun that takes place each year. Eastern European children are familiar with the legend of Frau Perchta, or Berchta. If you are a well-behaved child, you had nothing to fear. Perchta will slip into your home on the night of the Feast of the Epiphany and leave a silver coin in your shoe. But if you’d been bad, watch out! Frau Berchta treats naughty children mercilessly – she sliced open their stomachs, removed their internal organs, and replaced them with pebbles and straw. The name Pertchta comes from the same roots as Berchtentag, the Feast of the Epiphany, which is when she makes her annual appearance. Jacob Grimm associated her with the goddess Holda or Hulda, who is believed to have evolved into Frau Holle. Perchta appears in different ways, but typically she is portrayed as either young and beautiful, dressed in snowy white, or as an old and malevolent hag. Some legends claim she has one foot that is significantly larger than the other, and Grimm believed this was symbolic of her being a shapeshifter. Frau Pertchta is often viewed as a female counterpart to Krampus and is the focus of big festivals in some Alpine villages. Participants wear masks called perchten and dance around fires to drive away scary winter ghosts. Today, Frau Perchta is known as a being who rewards the good and kind… but those who lie or steal, or are lazy and wicked, will find themselves the recipients of her punishment! If you’re a child living in Iceland, you’ve probably been warned about the legend of Grýla. This giantess who lives in the mountains comes out of her cave in the wintertime, searching for naughty kids. When she finds them, she boils them up in a stew and devours them as a tasty snack. Grýla is the mother of the thirteen Yule Lads, who visit sleeping children on the thirteen nights before Christmas. In some legends, the Lads, who have creepy names like Meat Hook and Window Peeper, are just as awful as their mother, and eat children too. Grýla appears for the first time in Snorri Sturleson’s Prose Edda, but she didn’t become associated with the Christmas season until around the 17th century. By that time, kids were so terrified by the idea of Grýla that the Icelandic government had to step in and ban the use of her legend as a parenting technique. Instead, she was rebranded and presented in a way that has her spreading holiday cheer. As to the Yule Lads, now they just leave a rotten potato if you’ve been misbehaving. Imagine if Santa Claus had a sidekick who traveled around with him beating those who had misbehaved. Well, in France, St. Nicholas has Le Père Fouettard, whose name literally translates to “Father Whipper.” Sure enough, Fouettard roams around northern France and parts of Belgium, whip in hand, to give a few lashes to kids who can’t get their act together. The legend of Père Fouettard dates back to at least the 12th-century; it's a tale about an innkeeper – or possibly a butcher, depending on which version of the tale you're reading – who murders and robs three boys on their way to a religious order. After killing them and stealing their money, the innkeeper and his wife chop the boys up into bits and make a stew out of them to hide the evidence of the crime. When St. Nicholas figures out what has happened, he resurrects the boys, and the innkeeper – whose name is Fouettard – repents for his sins. As atonement, he accompanies St. Nicholas on his journey each year on December 6. Fouettard usually is portrayed as fairly dark and sinister in appearance, which is no surprise. Unkempt and ragged, with a long beard, he carries a whip or a switch to flog naughty kids. Knecht Ruprecht, or Rupert the Servant, is another companion of St. Nicholas, familiar to German kids. Appearing in a long black or brown robe, and carrying a stick and a bag of ashes, Ruprecht’s job is to ask children if they pray. If they answer in the affirmative, he rewards them with gingerbread, chocolate, fruit, and nuts. Guess what happens to kids who don’t pray? Ruprecht whacks them with his stick or the sack of ashes. The tales of Knecht Ruprecht go back as far as the Middle Ages, and he’s often associated with another German folkloric character, Black Peter. Jacob Grimm believed that like Black Peter, Ruprecht is a holdover from pre-Christian pagan beliefs. Grimm suggested that lore about beings such as these, as well as elves and household spirits, who punished unacceptable behavior, was a way of maintaining the social order. In some parts of Wales, the custom of the Mari Lwyd is first documented around 1800, but may be far older than that. Much like the Beltane hobbyhorse, the Mari Lwyd originally consisted of a horse’s skull mounted on a stick and decorated with ribbons. In later years, the skull was made of wood or heavy paperboard. Although scholars differ on the origins of the tradition, one consistent feature is that the Mari Lwyd is associated with the practice of wassailing. Between Christmas and New Years’, the Mari Lwyd is carried through the village by a group of men who knock on doors, singing and making merry. When the inhabitants answer, they are invited to engage in a battle of wits called a pwnco, exchanging rhyming insults – it’s a bit like a Welsh rap battle. At the end, the Mari Lwyd and her carriers are invited inside for refreshments, and her presence in your house is said to bring you good luck for the coming year. In Alsace and Lorraine, France, Hans Trapp is a Christmas boogeyman that parents invoke to encourage good behavior among their offspring. This legend originates in the 15th century, when Hans Trapp was a rich and greedy man who was said to worship Satan. When the Catholic Church learned what Hans was up to, they excommunicated him, and his neighbors in Alsace ostracized the man they had once feared. Eventually, his wealth was confiscated, and Hans fled to the forest, penniless. Living alone on a mountain, and angry at the loss of his fortune, he descended into madness, and one day attached a young boy who wandered near Hans’ shack. He chopped the boy up and roasted him over a fire, but before he could take a bite, a bolt of lightning struck Hans, killing him instantly. Belsnickel is yet another companion of St. Nicholas, and like many of the others, he’s not a very nice guy. He shows up in dirty, ragged clothes made of skin and pelts, carrying a switch to beat misbehaving children with, although he does keep sweets and gifts in his pockets for the kids who have been good all year. The tale of Belsnickel originated in in Germany’s Rhineland area, but German settlers brought him to North America in the early 18th century, and there’s still a popular tradition of the Belsnickel in parts of Pennsylvania, New York state, and Maryland. Belsnickel shows up in the weeks before Christmas to check out who’s been naughty and who’s been nice, and then he reports back to St. Nicholas or Santa Claus, depending on which version of the legend you’re reading. Also called Persnickel, Beltznickle, or Kriskrinkle, this creepy character is another anti-Santa, and you’d do well to make sure you’re good, so you don’t get hit with a switch. Some people hate to get clothing for Christmas, but if you do get a pair of socks or a funky sweater as a gift, it could save you from the Jólakötturinn. Iceland’s frightening Christmas Cat will eat you if you don’t finish your chores and get new clothing as a reward for your hard work. Those of you who are lazy will become cat food once the Jólakötturinn peers through your window. Regardless, if you work hard, you’ll get clothes as a gift, keeping you safe from the Jólakötturinn. This approach appears to work – the people of Iceland put in a ton of overtime, and no one has been devoured by a giant cat lately.